I just like to say that Paul's 'Suntup Press' website is one of the most impressive and classliest small press websites I've seen in a long time. The photography and short videos are stunning. Congratulations, Paul. I don't know if you do a lot of the work yourself or involve a site designer, but I'm very impressed. You definitely have me interested in the EOTD portfolio, the lettered sounds very intriguing. WELL DONE!! Hi Jon, thank you. I designed and built the site myself. I didn't design the logo. Just provided the direction and ideas. Also didn't film the video. Decided to hire a professional for that, otherwise it would have been this awful, shaky video taken on my iPhone! We just posted a contest on Facebook to win a signed promotional poster. I want to make sure my TDT friends who don't do FB are also able to take part. So if you are FB challenged, just email me here and I will enter you in the drawing. Be sure to type "Promo poster contest" in the "Message" field of the form. If you are entering on FB, there is no need to send me a separate email. Edit: Here's a link to the FB page with the contest. My view of Facebook is aptly summed up by Erin Pitt as Sharon Da Silva in the movie SILENT HILL REVELATION. Email for me also thanks for the contest Paul ! I never saw that movie Steve...and thanks for entering. Good luck! Thanks for entering Brian. Good luck! Planning something cool for the drawing. Thanks, Paul for this option! I must confess I entered on FB, but I have unfollowed almost everything but my book and horror threads. Can't take the crap anymore. I have to say that I am very impressed with the products, production and person responsible for these editions. Very well done, Paul!!! Thanks Brian and Ralph. Got your entries. Hey, you get what you earn, right? Go get 'em, buddy!!!! No problem at all, I think everyone here knows me like that. I just have my full name on Facebook is all, so I wanted to make sure you knew I was the same person!! LOL. Sounds like we are about the same in regards to FB. I've unfollowed almost everything...not sure why I didn't just close it. BTW I entered via FB as well...felt weird. Been meaning to post these. A couple of nice articles about the upcoming portfolio. You forgot this one, capisce? My bad. You always risk forgetting someone. There were others on social media as well. And thanks to Tomas for putting it in his newsletter. And of course Lilja. Here is an interview Lou and I did for The Stephen King Podcast with David Palladini and Paul Suntup. 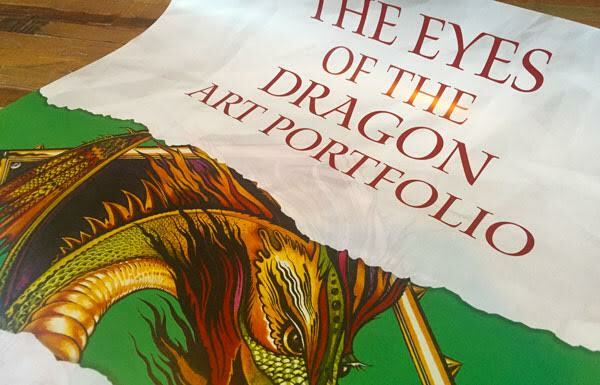 We also have a contest where you can win a color promotional poster for The Eyes of the Dragon Art Portfolio signed by David Palladini. Enter here. Thanks Lilja, the interview was fun and David said he enjoyed it as well. The Eyes of the Dragon Art Portfolio will be available for pre-order on Monday March 27, 2017 at 9am Pacific Time. Owners of the custom bound EOTD have now been given right of first refusal on a matching letter. As a benefit to email subscribers, and forum members, I will be sending out an email tomorrow (Thursday) and will provide early access to the site before the general public. If you aren't on the list, subscribe here before tomorrow and you will be provided with a password. Great stuff Paul! Thanks for the advance notice to the site!!!! No problem. Gotta take care of my forum friends! Great podcast. A just spent a very enjoyable hour listening to it whilst I worked. Hopefully you got some work done!